Further is a parser-based, lightly puzzly surreal story about a ghost negotiating its passage to the afterlife. Play time, roughly 10 minutes. Review after the jump, light spoilers in the sense that I describe what the gameplay is like. Further is fairly simple, both narratively and structurally. Structurally, the idea is that you have to move from one room to another, collecting objects that represent memories and connecting them with locations where those memories become clear to you. 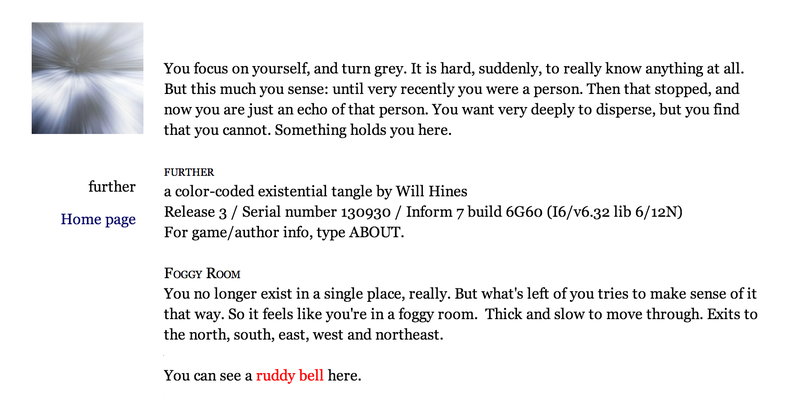 This is made easier because the objects and the rooms are both colored, and because if you’re holding an object that belongs to another room, focusing on that object will tell you which direction to go next to get to the place where you can use that object. This means that the gameplay is mostly a sequence of wandering, finding an object that functions as a little GPS device, following its directions, unlocking the memory; then wandering a little more, finding another object that functions as… etc. It’s essentially a color-coded lock and key sequence. There’s something a little special about the final room of the game that requires a slightly larger leap of understanding, but that’s about it as far as gameplay progression goes. The narrative premise is that you’re an amnesiac ghost in a foggy, half-unrecognizable space who needs to recollect certain key locations and events before you’ll be ready to move on to the next plane of being. “You’re a person with no memory who wakes up in a location with no characteristics” is pretty much my least favorite IF opening ever, and I’ve seen it a very large number of times at this point. Generally it fills me with the gloomy expectation that I am about to play something incomprehensible but vaguely “spiritual,” written by someone who did not think of a plot hook before starting to write. But, to be fair, “Further” gets away with it better than some, for two reasons. First, it does move on to show the player some recognizable places and events reasonably soon; and second, the disciplined structure keeps it on track, providing definite goals throughout. The actual memories you’re recovering are, perhaps against expectation, basically happy ones. This isn’t about exploring the traumas of the protagonist, but of recovering a few happy moments from what seems to have been an essentially fulfilling life. So, overall: a good-natured if not challenging piece, executed without (so far as I could see) any bugs or technical hiccups. Hehe, I’ve now played Further too, and been able to read your review Emily. And playing on iPhone Frotz, I had pauses of up to 25 seconds.